Are you interested in learning how to do computer programming?Are you wondering which programming language would be best to learn?Have you considered trying Java?Java is perfect for designing desktop apps and for a wide range of industry. It is easy to learn and even a complete novice can quickly grasp the concepts and be using it within a few hours of getting started.In this book, Java for Beginners: The Complete Guide to Learning Java for Beginners, you will be given all you need to get going with chapters that examine:Getting startedThe different variablesOperatorsLoopingOverridingCommand-line argumentsJava appletsAnd much more…Even if you have never tried programming before and even if your computer knowledge is basic, you can still learn how to use Java to enhance your experience and start writing and running your own codes. 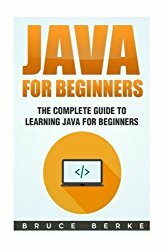 Get a copy of Java for Beginners: The Complete Guide to Learning Java for Beginners today and see how this simple yet innovative programming language is perfect for you!Scroll up and get your copy now!